Researchers love attending Biotechnology Calendar, Inc. events because we provide the opportunity to meet researchers from other departments at your university and learn about the latest life science solutions from lab supply sales reps. Our delicious catered lunches provide a break from time in the lab or the classroom and are the perfect opportunity to socialize over a meal with colleagues. Some of the lunch items we provide at our life science marketing events often include bagels with cream cheese, pizza, sub sandwiches, cookies, brownies, vegetables and dip, coffee and tea. Another benefit of attending our Athens BioResearch Product Faire™ Event will be the opportunity to network with colleagues and lab supply companies. Everyone from your lab is invited to attend this event, but researchers will also be able to discuss their work with colleagues from other departments. Perhaps researchers from other departments will have insight on your work, being able to understand what you’re working to accomplish through a different disciplinary lens. Lab supply sales reps will also be interested in hearing about your work. If you’re having problems in the lab related to the amount of time or money you spend, sales reps at this University of Georgia, Athens event may have the perfect life science solutions to help you address these problems. When you attend our University of Georgia, Athens life science marketing event, you also have the chance to win exciting prizes. One of our most popular prizes is our Science Ninja t-shirt, which attendees often wear posing in front of our photo booth. For pictures of our Science Ninja life science marketing event attendees, you are welcome to view our Instagram page. Our sponsor tables give out fun event bags and lanyards to researchers who stop by, and all attendees are also in the running to receive a grand prize at each event, such as an iPad. 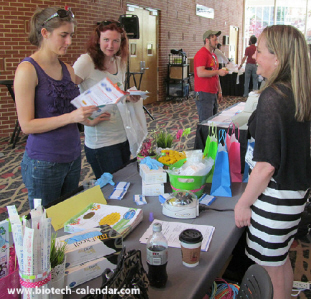 If you are a researcher, purchasing agent, post-doc or lab manager interested in meeting other researchers and learning about the latest life science solutions available on the market, Biotechnology Calendar, Inc. invites you to attend our Athens BioResearch Product Faire™ Event on February 26th, 2014. Don’t miss out on this opportunity to network with colleagues and lab supply companies, learn about the newest lab products, enjoy delicious food and win prizes. Biotechnology Calendar, Inc. is a full-service science research marketing and events-planning company that has been organizing life science marketing events at top research institutions for over 20 years. If you are interested in meeting researchers at life science marketing events closer to home, we encourage you to view our 2014 calendar of events. For more information on our Athens BioResearch Product Faire™ Event, please click on the button below.